Growing standard of living, awareness towards health, increase adoption of modular kitchens and replacement of existing kitchen hoods are some of the factors leading to the rising kitchen hood demand. Also, with the upcoming event 'World Expo 2020' in Dubai and consequently burgeoning tourism, hospitality, and residential sectors to further propel the market of kitchen hoods in the country. In UAE, the Dubai region accounted for largest revenue share in the overall UAE kitchen hood market share, followed by Abu Dhabi and Northern regions. Major construction projects across commercial and residential verticals, coupled with increasing health awareness among consumers are the key factors leading to the growth of kitchen hood market. Some of the key players in UAE Kitchen hood market- BSH Home Appliances, Elica, Faber, Teka, Whirlpool, AB Electrolux, CNA Group, Elba, Miele Appliances, and Candy. The UAE kitchen hood market report thoroughly covers the market of kitchen hood in UAE by installation types, fitting types, applications and regions. 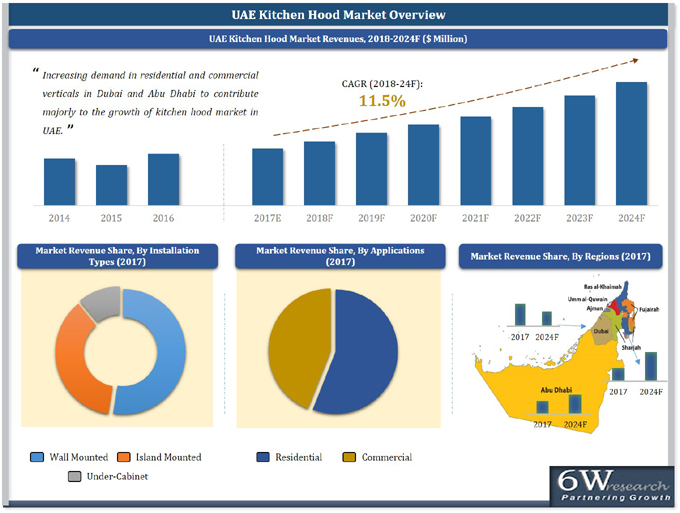 The UAE kitchen hood market outlook report provides an unbiased and detailed analysis of the UAE kitchen hood market trends, opportunities/high growth areas, market drivers, which would help stakeholders to device and align market strategies according to the current and future market dynamics.